SHOULD I KILL A CANE TOAD IF I SEE ONE? It’s a personal decision as to whether or not you should kill toads. They are not protected by Australian wildlife regulations but they ARE covered by animal-welfare laws – so if you do decide to kill a toad you need to do it humanely. We talk more about that below. – and so a lot of native frogs have been killed by mistake – including endangered species – because people have thought they were cane toads. So please – make very sure that the animal you have found really IS a toad before you attempt to kill it! This sounds a bit silly - most people are sure they could tell the difference between a cane toad and a native frog. But, sadly, they can't. Of 97 phone calls to a community group from members of the public reporting they had found cane toads (in response to a recent Sydney "stop the toad" campaign), only 5 ended up involving cane toads - all the rest were actually frogs, and one was a lizard! TEAM BUFO took cane toads and native frogs to shopping centres around Darwin, and we asked local people which amphibian was which. There were lots of errors - around 30% in some cases. This really suggests that it is risky to start killing "toads" unless you are 100% confident that the animal in front of you isn't an endangered native frog! So please be sure of the animal's identity before harming or killing it! For people in Australia, the Frog Helpline on 0419-249-728 may be the first port of call. 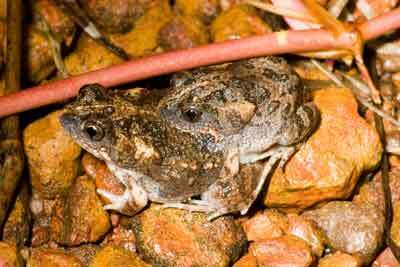 HOW CAN I TELL THE DIFFERENCE BETWEEN A CANE TOAD AND A NATIVE FROG? 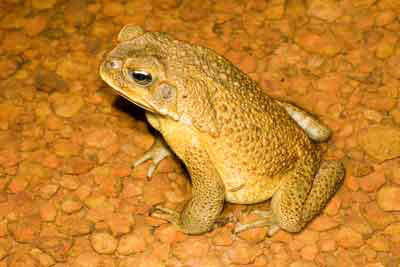 The simplest difference is size – cane toads grow much bigger than any native frogs. And if it’s a really big animal, you can clearly see the toad’s rough warty skin, big poison glands on its shoulders, bony ridges above its brows, and so forth. Looking at pictures in websites like ours is a good way to check. But it’s much harder to tell the difference if the toad or frog is small – less than about 2 cm long. Even professional biologists often mistake baby toads for frogs, and vice versa. Soon after Rick got his first high-quality camera, he went on a field trip in Queensland to photograph animals – and took an entire roll of film photographing a beautiful little frog that he later discovered was a baby cane toad! So please check carefully, and be sure that the animal you are about to kill isn’t a native frog! You can see from these photos that it is difficult to tell different species apart. If you are in doubt about the identity of an amphibian you have found, call your local National Parks and Wildlife office, or the Frog Helpline (0419-249-728) for assistance. Most Australians don’t like toads, and some really hate them. Other people believe that the toads themselves aren’t really to blame for being in the wrong place (Australia) – after all, they didn’t ask to be brought here! We feel this way – so that although cane toads don’t belong in Australia, and their numbers should be reduced as much as possible, it’s also important to be sure that toads are killed humanely. There are lots of ways to kill toads, and some are really brutal. To kill a toad humanely, the easiest approach is to pick the animal up (gloves are a good idea, to ensure you don’t get exposed to the toad’s poison!) and put it in a plastic bag, then pop the bag into the fridge. After a few hours the toad will be pretty much asleep (although still very much alive) and you can pop the bag into the freezer. Leave it there for a long time – preferably a few days – because there are lots of stories about apparently-frozen toads coming back to life if they haven’t spent long enough in the freezer! Sometimes the edges of a pond are covered by hundreds of tiny little toads, that have just transformed from tadpoles. How should you kill them? Some community groups suggest spraying them with dettol or bleach, but the effects of such toxic chemicals on the ecosystem may be worse than the effects of the toads - we simply don't know. Our experiments show that spraying dettol drives away meat ants, that otherwise might feed on the toads- and the dettol also kills the toads' lungworm parasites. So, spraying dettol around the edge of a pond may do more harm than good in terms of toad control, as well as in other ways. Nobody has conducted research to see if spraying these substances has ill effects on other wildlife. Until that research has been carried out, we don't think that spraying poisons around waterbodies is a good idea. 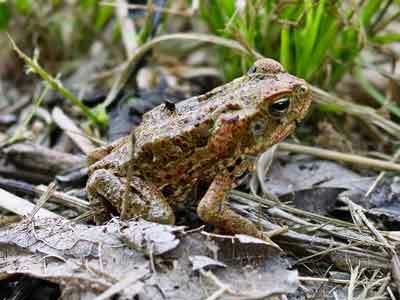 It will kill the toads, but it may affect other native creatures also.